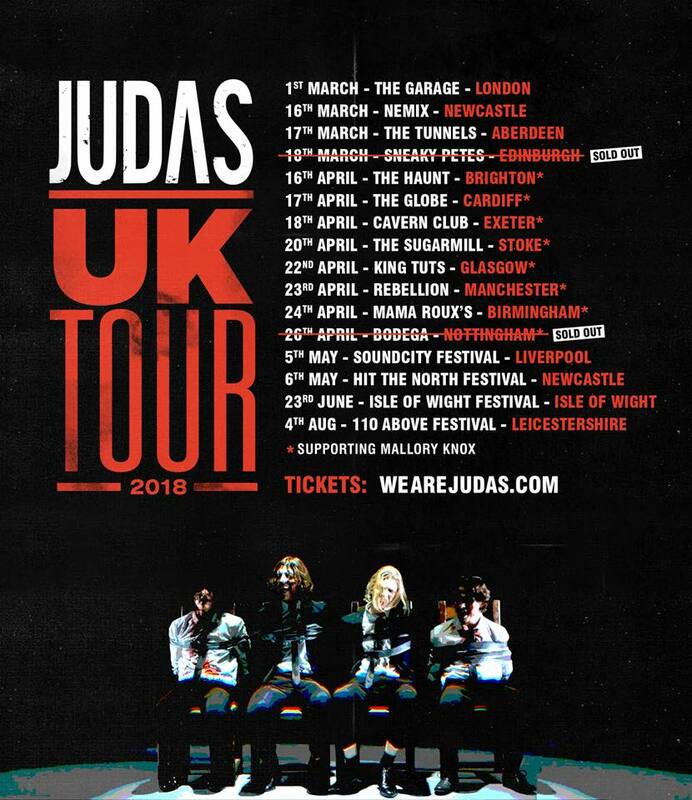 By no means strangers to the Newcastle music scene, London rockers JUDAS have been well overdue a return to the city since delivering a rather memorable performance at Hit The North festival last year. So when this headline show was announced at the Nemix Recording Studios as part of their UK tour many fans, like myself, were filled with delight. Despite the band being in their pre-debut album infancy, the Camden-based four-piece have already gained a huge following and hit some huge milestones, including playing in front of vast crowds at main-stages of Reading & Leeds Festival. But then that comes as no surprise for a band with song-writing skills on par with their ability to deliver explosive live performances . For anyone out there who hasn't heard of JUDAS yet, tell us a little about yourself, your sound and who does what in the band. We're a four piece, Scouse led, London based rock band with a killer live show and a catalogue of indie anthems. Liverpool born John sings and plays Guitar, Todd plays lead guitar, Jay plays Bass and Sam is on Drums. We all live together in Camden and spend most of our time writing songs in our flat. Having played Reading & Leeds main stage so early into your career is a huge achievement for you no doubt. How did this come about and how does playing to such huge festival crowds compare to the small intimate venues, such as those on your current tour? Back in 2016, we were booked to play the This Feelings “Jack Rocks” tent at Leeds Festival. Shortly before our set we were told that a slot had opened up, on the main stage and asked whether we would like to play it. It was a miracle. We were all jumping around like lunatics. We played the set on Jack Rocks and were immediately flung onto the main stage just moments after, for another set. It was the best day of our lives. Much to our surprise, early in 2017, we received an offer from the festival, to actually open the main stage at both Reading and Leeds. We must have impressed them the previous year. The difference was though that we had 6 months to prepare rather than around 6 minutes. Opening the main stage at the festival was incredible and such an honour. It's very strange going from huge festival stages to intimate venues. Obviously its great playing on huge stages, but also seeing the whites of the eyes in the crowd and watching people sing and dance just feet away from you in a smaller venue is an amazing feeling too. You've played Newcastle on a few occasions before, including Hit the North last year. How has the reception been by North East crowds to your music? Think Tank Underground was one of our favourite places to play last year. It's a show that really stuck with us, and we managed to sell it out, which none of us were expecting. We're so excited to return to Hit the North too, it's a superb festival with tonnes of amazing bands, and the city always has the best atmosphere during the festival. What are your plans for 2018 besides the tour? You've released some pretty strong anthemic singles over the last 2 years; are there any plans on an album or EP? We have new music coming before the end of the month; and a stonker of a video to go with it. We can't wait to release it. We're off on tour with Mallory Knox in April and have some other great shows in the pipeline that are yet to be announced. It's probably the most exciting time for us now, more than ever. We're so excited for the next few months, we have so much planned.